The firm was founded as iron founders by Thomas Perry in 1806. A trade directory of 1818 listed Thomas Perry as an iron merchant trading in the Highfields district of Bilston. By 1850 the firm was certainly well established and were noted in a trade directory as iron founders and manufacturers of wrought iron bedsteads, fencing, hurdles, railing, gates, palisades and other wrought iron and cast iron work. A book issued by the company in 1967 says that "the company started as a general iron foundry and produced heavy and elaborate cast iron railings, gates, coats of arms and the like, still to be seen in the old residential districts of London and other cities. In 1848 it produced bridge castings for the Great Western Railway. It made rolling mills for rolling wrought iron, steel and non-ferrous metals and auxiliary mill machinery including shears and rtoll lathes and steam engines to drive them; two foundries were built for the making of large and cast iron roll mills." At some point they started specialising in the heavier end of the trade and they seem to have got into the production of armour plate, for war ships and gun batteries, quite early on. 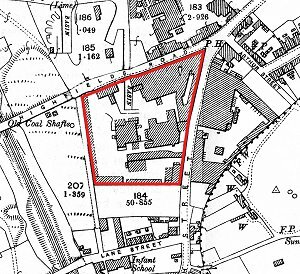 Perry's site in Bilston on the 1902 Ordnance Survey map. The site is at the junction of Highfield Road and Ash Street. Perry's at some time owned premises on the other side of Ash Street but there are no details of this. Note that the site has no immediate access to either a canal or a railway. We know of no concern which has done more to raise the character for engineering skill in the Black Country than Thomas Perry & Sons. This is a highly respectable old firm engaged in metallurgical pursuits. 50 years since - the firm then was Thomas Perry - the family resided at Bilston, and as there were at that time numerous Perrys in business, Mr. Perry, to distinguish him, was always called ‘Gentleman Perry,' and was highly esteemed and loved by all classes. Mr. Perry, with Mr. Sparrow, was one of the founders of the Bilston District Bank, and remained a director until his death. He was quiet, unostentatious, always a gentleman, was never known to forget himself or become agitated in business; he was amiable and polite to all; a great friend to his church and the clergy; a man of spotless and the highest reputation. In the social circle at home for goodness he was unequalled in all Staffordshire; so amiable, so gentle, truly polite and kind was Mr. Perry in his own family to each member to the day of his death, although he lived to an advanced age. Mr. Charles T., the eldest son, married Harriet, the third daughter of the late G. B. Thorneycroft, Esq., the first mayor of Wolverhampton and the founder of the firm of G. B. Thorneycroft & Co. Mr. Thomas Perry, the second son, is now at the head of the concern under review. This foundry has a world-wide fame, and has done more in supplying new machinery and appliances, abreast with the rapid progress the Iron trade has made during the last ten years, than many other establishments. An older part of the Perry works, facing Highfield Street, as it is today. Steam engines and all kinds of machinery are their great specialities, with all modern inventions in rolls and machinery in Ironworks. At this foundry the choicest brands of pig Iron are kept in large quantities, including Lilleshall, Madeley Wood, Blaenavon, Weardale, and different Swedish brands, mixed in proportions known only to Perry & Sons, to make soft and chilled rolls, for rolling plates, sheets, armour plates, &c., &c.; for the manufacture of which this firm is justly celebrated. Here some of the rolls used at the Earl of Dudley's, W. Barrows & Sons, the Barrow Steel Company, Robert Heath & Sons, the Blochairn in Scotland, and most other great concerns, are made. From this it would appear that by 1873 Perrys, now under Thomas Perry's second son (another Thomas Perry), was specialising in making rolled plate, especially armour plate, and in making rolling mills and other foundry machinery. Vast foundries, where every conceivable article of machinery and skill is made, still exist in this town. The manufactured goods produced by Thomas Perry & Co, of Highfields – established in 1806 – for excellence of material and workmanship have competed with and rivalled the manufactures of the whole world. The enormous "plants" for the manufacture of steel armour plates for war ships and batteries, have been made here. Huge engines – masterpieces of strength, size, and mechanical superiority – are also numbered among its productions. The "testing" of the "castings" previous to their being sent from the works to their destination, enables the workmen to detect any unsoundness or faults, and insures to the purchaser a genuine article. Orders are executed for countries situated in every quarter of the globe; nor are our own government orders rare either. The "fire and thief proof safes" made by them have justly attained a wide celebrity. Several monster safes have been made by this firm for foreign governments, which are wonders of skill, strength and ingenuity. The firm also does an immense trade in brass bedsteads." At some point, therefore, Perrys had decided that their armour plate gave them a good entry point for making safes. The brass bedsteads seem to be a hangover from the lighter kinds of work recorded as being carried out in 1850. There were many firms in Bilston making brass and iron bedsteads.